With Element Rewards you earn points with every purchase! Earning Element Reward Points is super easy! 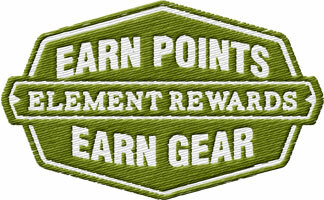 Every time you make a purchase with Element Outfitters, you'll earn more Element Reward Points. The more Element Reward Points you earn the bigger your reward. 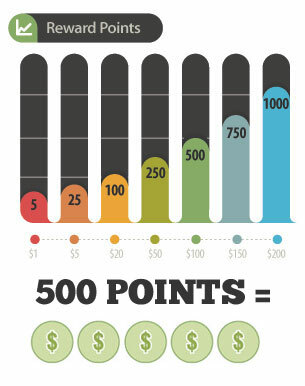 Element Reward Points can be redeemed for actual $$$ towards your next purchase. Write a review to earn even more Element Reward Points. If you leave a review for a product that is helpful we'll reward your efforts with 100 points. If your review is over-the-top fantastic, we'll throw 250 points your way. Good or bad we want to know what you think! Already made a purchase? Redeem your Element Reward Points now! Now for the fine print. *Reward points may vary. Double rewards may be offered on some brands. Closeout items, as well as, some specialty items will offer lower reward points. Exact reward points are posted on each product. **Once you've placed your order and it has shipped, your ElementRewards™ points will be redeemable in 14 days! Element Reward Points are only available and redeemable on online purchases. All reward points will expire after 2 years. Items purchased with rewards points CANNOT be returned, sorry. Rewards points will be deducted for all purchased Items that are returned for a refund. Start Earning Your Rewards Today!